Wanted: One amazing forever home for one amazing sixth grader. "My name is Gaby, and I'm looking for a home where I can invite my best friend over and have a warm breakfast a couple of times a week. Having the newest cell phone or fancy clothes isn't important, but I'd like to have a cat that I can talk to when I'm home alone." Gaby Ramirez Howard loves volunteering at the local animal shelter. She plays with the kittens, helps to obedience train the dogs, and writes adoption advertisements so that the strays who live there can find their forever homes: places where they'll be loved and cared for, no matter what. Gaby has been feeling like a bit of a stray herself, lately. Her mother has recently been deported to Honduras and Gaby is stuck living with her inattentive dad. She's confident that her mom will come home soon so that they can adopt Gaby's favorite shelter cat together. 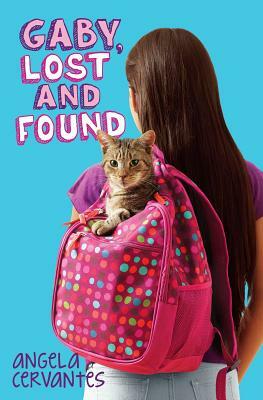 When the cat's original owners turn up at the shelter, however, Gaby worries that her plans for the perfect family are about to fall apart. Angela Cervantes is a writer and poet. Her poems and short stories have appeared in The Kansas City Star and Chicken Soup for the Latino Soul. She currently lives and writes in Kansas City where she founded the Latino Writers Collective.